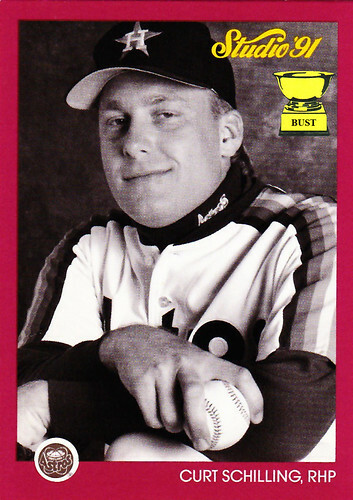 Curt Schilling's train of thought from 2:14 to 2:16 p.m. April 3, 1991: "I can't believe I'm here. I can't believe they dragged me to this studio for another crappy baseball card. How can I make it look cool? Well, I already look pretty hunky in this turtleneck. But that's not enough. What to do? What to do? Maybe I'll show them my fastball grip. No, that's not great. What about my curveball? No, that won't work. How about the change-up? Nah, nothing doing. The slide piece? The forkball? The slurve? No, no and no. Eureka! I've got it. I'll show the photographer the move I used on his sister last night."